Rhinoplasty continues to be one of the most popular cosmetic surgery procedures. However, with so many specialist surgeons promoting their services online, how can you ensure your clinic and expertise stands out? Having worked with numerous cosmetic surgeons in Australia, including rhinoplasty and ear, nose and throat (ENT) specialists, our team at Total Medical Design understand the unique demands of marketing surgical services online. We can help you create a professional looking site that opens a doorway to your clinic and enables you to make a great first impression. Our designers will not only make it stand out visually but also ensure your site is mobile and SEO friendly, easy to navigate and incorporates the important elements today's patients are looking for such as before and after galleries, videos and online forms. 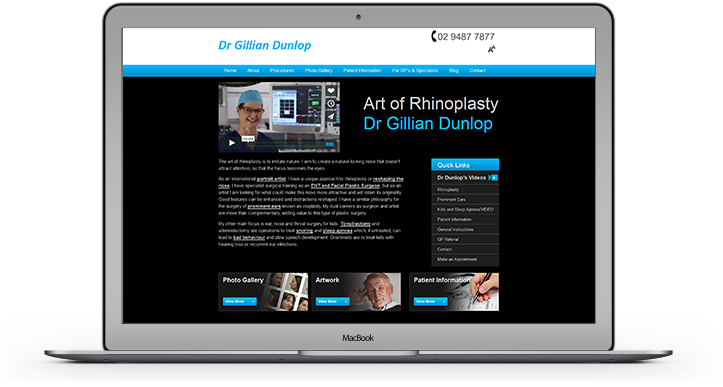 As well as offering professional rhinoplasty and ENT web design and development, you can also speak to us about our wider range of medical marketing services from rebranding and logo design to email marketing and copywriting.